Beautiful lingerie, intimates, and sleepwear have been sought after for years. European women have always appreciated the finest fabrics, laces, and workmanship that their brands offer. We have brought that same couture quality to our sleepwear and lingerie to our customers for the last few years. Our customer are loving the gorgeous look and feel of Julianna Rae undergarments and sleepwear. For that special evening or for every day - our best selling beautiful nightgowns and chemises have you feeling as beautiful as you look. A matching silk full length robe to complete the look give you the glamour you know you deserve. 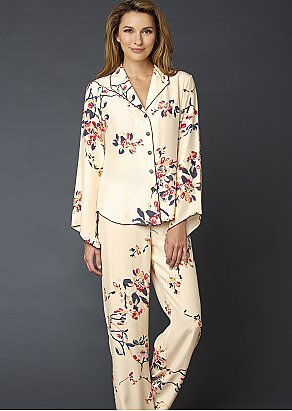 Julianna Rae lingerie and sleepwear is a name synonymous with quality and beauty. Drape yourself in luxury from head to toe. Our long silk robes are the perfect choice. See our most popular full-length silk robes. Our Il Cieli Spa Robe has been a perennial best seller for good reason - fully reversible with one side made of luxurious silk and the other side made of micro-terry long staple Egyptian cotton. Stepping out of the shower into a luxurious hug is oh so comfortable and then flipping the robe to have beautiful silk against your body is a divine way to end the evening. Indulge yourself the way you deserve with one of our long silk robes. You'll wonder why you waited so long. Whether you are looking for a long nightgown for a glamorous look or a shorter chemise to feel elegant after a busy day, Julianna Rae’s line of silk nightgowns and chemises has a classic style perfect for women who deserve to be pampered. Made only of the finest silk with tasteful delicate lace details, our nightgowns and chemises feature deep V necklines and cuts to flatter your figure. See what customers are loving in nightgowns and chemises and drape yourself in luxury.